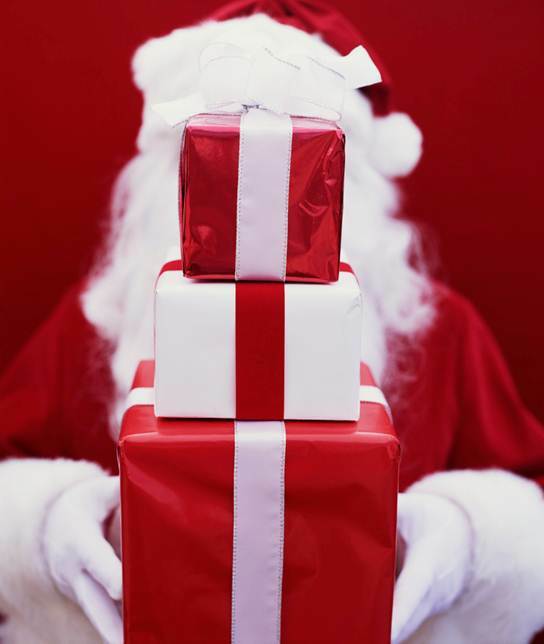 Have you ever played one of those ‘dirty Santa’ games at Christmas? You know, the kind where you can pick a gift then someone has the option to take it away if they like it? I don’t even think its fun. In fact, they can become brutal! All the presents are there, waiting for the first person to pick. 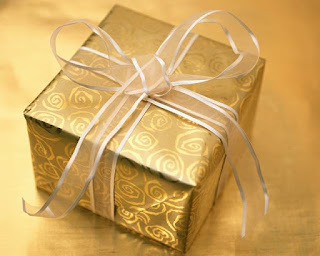 After serious scrutiny, the package that is wrapped the prettiest is chosen. But unwrapped, the gift inside is less than ideal. There have actually been studies showing that nicely wrapped gifts set high expectations and magnify disappointment when the gift is less than perfect. It’s even been recommended that unexceptional wrapping can improve the joy of receiving even a wonderful gift because the wrapping won’t build up any false hope. Who knew? I’ve been wrapping correctly for years! A long time ago we actually thought it was fun to go shopping the day after Christmas. We seldom had a specific article in mind but rather went for the amusement of finding a bargain. One of the things we usually picked up was wrapping paper. There was some kind of warped thrill in finding $4.00 a roll wrapping paper for fifty cents. One year we found “Space Jam” paper at an after Christmas sale. 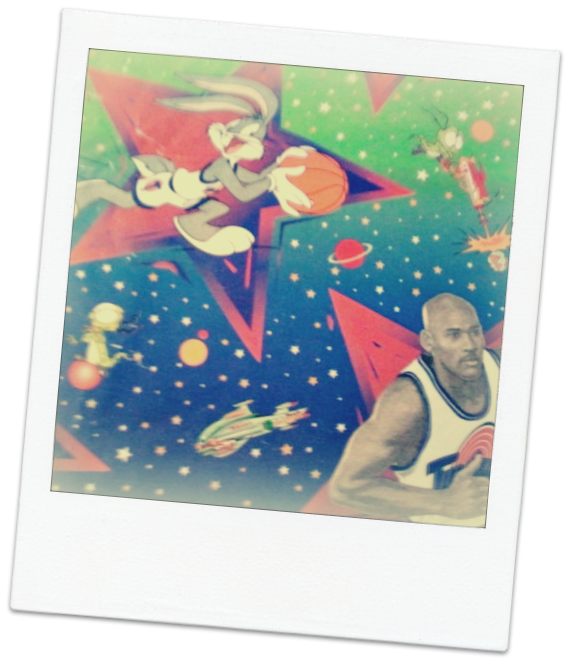 “Space Jam” was one of those movies that combined cartoon characters with real people. 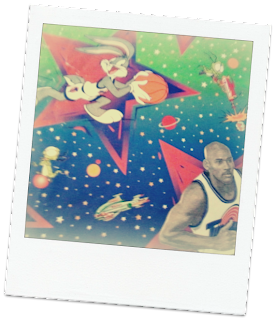 Bugs Bunny and Michael Jordan were the stars. By the time we got around to using it, “Space Jam” was available on tape (back then) and the kids didn’t even know who the man with Bugs was on that paper! So you’ve probably gathered, I don’t spend a lot of time and money on the outside of the gift. But it’s not a bad thing, especially since it becomes trash the minute the present is opened! Not only do I usually not have the time but I don’t have the skill. Enter one of the best ideas ever. 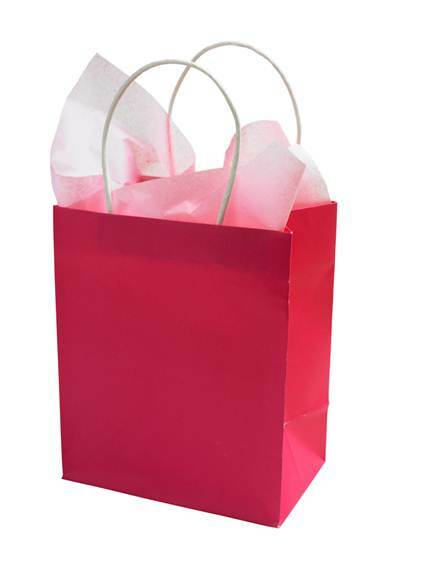 Besides my odd collection of wrapping paper, I now pick up gift bags and printed boxes on sale! It’s the greatest thing yet! Put whatever you want inside, stuff in or wrap tissue paper around and voila! It’s done! 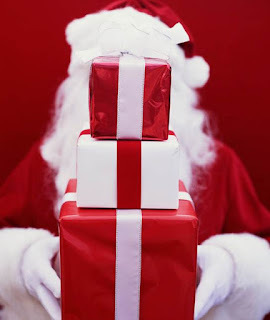 Next time you get your choice of the wrapped presents don’t turn up your nose at the one that’s mediocre looking. It might be the paramount of surprises! 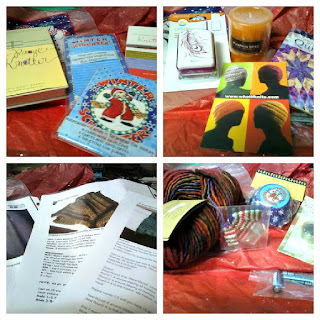 "My box included Stephanie Pearl-McPhee's Free-Range Knitting, Mary Beth Temple's The Secret Language of Knitters, a skein of Manos del Uruguay in the most wonderful variegated reds with a little purple and brown. You could not have picked a better color to send me if I'd been with you when you bought it. I also found note cards, a list pad and cupcake cups from Mary & Co., a lovely tape measure from Vintage Impressions in an antique silver finish, a clip-on OttLite with 12 LED's with a peacock feather in purple on the cover, 3 patterns for fingerless mittens, a hat pattern, and the tiniest sweater from Lantern Moon...a key chain. There was also a lovely pumpkin spice candle which I know we will enjoy. Every item was wrapped in glittery tissue paper and tied with red ribbon." Secret Santa package going out. Clever, I know. I love to wrap! Next time you go buy paper on sale, go to Hobby Lobby. They have the good stuff. I'd certainly pay you! I seriously don't have the knack. I've tried. Good idea to register the name. I have an idea for a business someday. Maybe I should go ahead and register the name! My dad taught me to wrap - don't dislike that I can use only three pieces of tape on most square or rectangle packages.